About seven years ago, there seemed to be a renaissance of fairy tale retellings and reimagining that swept through popular culture. From television shows like Once Upon a Time and Grimm to movies like Snow White and the Huntsman (2012) and Mirror Mirror (2012) to the books of Melanie Dickerson, it seemed that wherever you turned, you could find someone’s different take on classic fairy tales. While perhaps a little outside this bubble of pop culture, Spinning Silver has the benefit of standing out in a field of genre books that seems to have cooled in recent years. 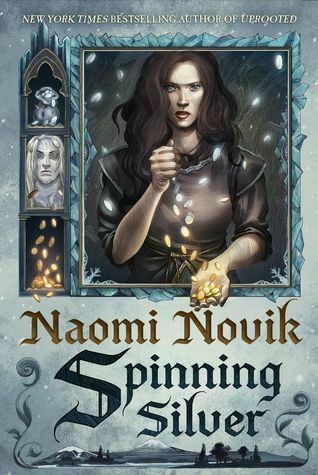 Based partially on the story of Rumpelstiltskin, author Naomi Novik has masterfully combined elements of Jewish and Russian folklore to reimagine this story from a somewhat more modern perspective while also maintaining its fairytale settings and tropes. If anything, her strong and independent female characters highlight how chauvinistic the original fairy tales seem when compared to the culture we’re living in today. I appreciated how smart the story is, taking the concept of “turning silver into gold” from a merely economical standpoint and turning it on its head by adding in fantastical elements more akin to alchemy. While the point of view of this book jumped around from a few of the characters, I found the interconnectedness of their stories to be incredibly well done. I probably would have left out the old woman’s POV, since it didn’t add anything other than some unnecessary backstory, but other than that, each character’s storyline had its own tone, challenges, and uniqueness to make the entire plot a well-rounded affair. Writing the story in this way helped to humanize antagonists, provide the terror of poverty, and show plenty of character growth throughout the characters. Even the fact that the “simple” solution of the climax wasn’t the best solution for the characters speaks to the depth of thinking that went into this brilliant plot. An intelligent and well-written fairy tale reimagining, I give Spinning Silver 4.5 stars out of 5.